El Reventador volcano erupted in early November in 2002, 90 kilometers northeast of Quito. Repeated explosions produced ash clouds, constant gas columns, and lava flows, alarming the population of several provinces of Ecuador. Whereas this volcanic activity did not cause deaths directly, it did cause respiratory, ophthalmologic, digestive, and dermatological problems. Furthermore, it generated an emergency in drinking water supply and sewerage systems because ash contaminated water sources and affected the general production of water. 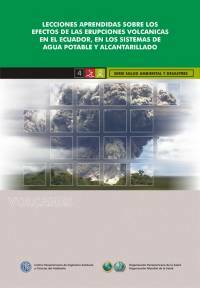 This document analyzes the effects of the eruptions of 2002 caused on water and sewerage systems of the three most affected Ecuadorian provinces: Napo, Sucumbíos, and Pichincha, where the Metropolitan District of Quito is located. Taking into account both urban areas and rural, the text systematizes the information on the impact of the eruption on different aspects of water and sewerage systems, highlights the lessons learned about the phenomenon, and makes suggestions to face similar events in the future. The document is a reference for those involved in preparing strategies to manage this type of phenomenon in other Latin American and Caribbean countries.